The foundational publications on inquiry-based learning (inter alia, Huber 2009) demonstrate that there is a clear overlap between the emancipatory objectives of the higher education didactic principle, which has been discussed since the 1970s, and educational concepts in the fine arts: Students’ self-responsibility and independence regarding their methods and topics, practice and experience as a productive aspect or the necessity that the activity have social relevance are some of the aspects that both educational concepts have in common. 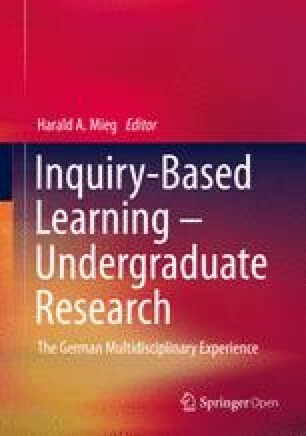 The objective of engaging in a process of constantly questioning any existing statement with inquiry-based learning can also be associated with concepts that have been valid in the arts since the 1960s. This article is based on the results of the “Ästhetische Praktiken nach Bologna” project (“Aesthetic practices after Bologna”) (2013–2016; Zurich University of the Arts, 2013), a collaboration between the Swiss Federal Institute of Technology in Zurich (ETH), the Berne University of Arts (HKB) and the Zurich University of the Arts (ZHdK). We would like to thank the SNF for its financial support and Monika Kurath, Priska Gisler, Anna Flach and Drilona Shehu for their critical comments.